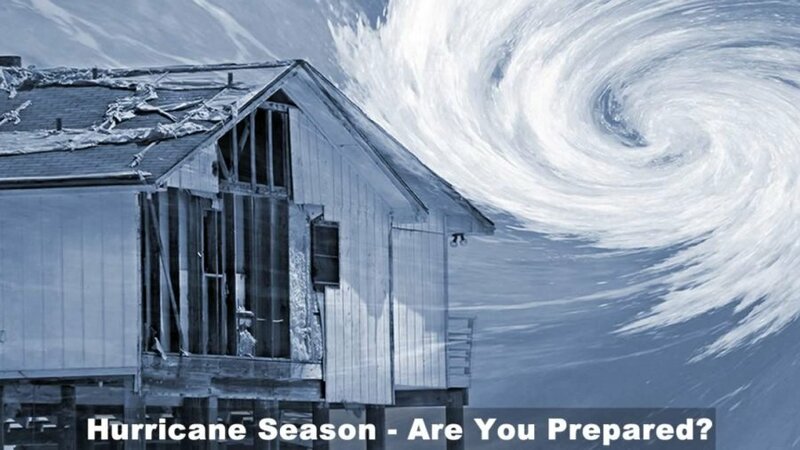 Hurricane Begins Soon – Do You Have a Hurricane Preparedness Plan? If you live in any of the Atlantic states, hurricanes are a very real threat to you from June 1 to November 30, the official window that encompasses the Atlantic hurricane season. Over the past few years, we’ve seen that it’s not just the coastal states that need to have a Hurricane Preparedness Plan. According to researchers in the know, there’s a 70 percent chance that a major hurricane will make landfall on the US coast this year, compared to the average 52 percent chance. These same researchers are predicting that we’ll experience 18 tropical storms, nine of which may turn into hurricanes. Since both tropical storms and hurricanes spawn tornadoes, those are a danger as well, and yet another reason to practice your hurricane preparedness. As with any emergency, the best thing that you can do to keep your family safe is prepare. That doesn’t just mean stocking water and canned tuna; you may not be able to leave your house for several days, you may not have any power or gas, or you may need to leave immediately. Regardless of the circumstance, you should be prepared in advance because stores tend to run out of food, water and building supplies several days before hurricanes hit. Also, if you need to leave, there are some things that you’ll want to prepare in advance. Prepare your house in advance. Have hurricane shutters, plywood and extra tarps on hand before a storm because these items sell out quickly. Our hurricane kit contains a tarp that you can use to cover a damaged roof or to use as shelter if need be. If you plan to stay home, consider purchasing a generator to get you through. They come in varying sizes and you can often pick them up in used condition fairly affordably. When the electricity goes out, gas stations can’t pump so fill your cars up with fuel a couple of days in advance. It’s also common for stricken areas to run out of gas following storms because trucks can’t get there due to blocked roadways, so it’s best to just fill up before. Don’t forget to stock up on fuel for your generator and rotate it regularly so that it doesn’t go bad. Grocery and convenience stores can’t open if they have no power and if they don’t have backup generators, they can’t sell anything. Often, they sell out of staples prior to the storm and don’t have much to offer anyway. As with gas, it may take a few days or even a week to get trucks in to restock after the electricity comes back on so it’s better to have at least 3 days’ worth of food stocked, although a week’s supply is better. You have many resources in your house that you can use to store water if you have a well. The bathtub is a great place to store water to wash with and flush the commode with. Our hurricane kit comes with a bathtub bladder that you can store drinking water in. Storms often change paths or speed unexpectedly so keep a NOAA emergency radio handy to listen to the latest updates. The typical homeowner’s policy does not cover flood damage so you need to make sure that your policy is beefed up so that you’re covered. A good website for that is www.floodsmart.gov. The best thing that you can do aside from stocking your pantry with food and water is to have a hurricane preparedness plan. You never know what’s going to happen and if you and your family become separated; you need to have a plan already in place to get back together and get to a safe place. Texting and email are great forms of standard communication but you also need to realize that you may not have any service, so you need to have a backup plan. Here are a few tips to help you establish your plan. Establish an out-of-state contact for relaying information and let them know that in an emergency, you may show up for a visit. Have a bug-out bag (BOB) for each member of your family. You can read more about this in our Bug-Out Bags article. Emergency numbers including local utilities, safe hotels outside the area, hospitals, the Red Cross, and your insurance company. Review your plan and make sure that everybody in the family knows it and understands it. Keep your bug-out bags handy so that you can just grab them and go. Have a full tank of gas before the storm starts. Know alternate routes to your evacuation spot in case your original route is blocked. Secure valuables such as jewelry and pictures in a small, portable, waterproof box so that you can just grab it and go. Plan for pets and make sure that if you’re going to a shelter, you pick one that accepts pets. Learn how to shut off your water, electric and gas to reduce the risk of damage to your home. Our hurricane kit contains a shut-off tool for this. Have several hotels outside of the danger area scoped out in advance and book as soon as you decide to leave because they’re going to fill up fast. Lock up your home and property as much as you can before you leave. These are just a few tips to get you started. Here is a full hurricane preparedness plan from Fema (hurricane-preparedness-plan.pdf). By making hurricane preparedness plans in advance and having your hurricane kit and bug out bag handy, you’re going to save yourself a ton of time and you’ll be ready when all of your neighbors are running around trying to do things last-minute. You’ll avoid fighting for food at the store and you won’t have to worry about what you’re going to do, because you’ll already know!